Who can resist and M&M?! I know I can’t, especially the peanut M&M's. Mmmm…..
Over the past month I have read a few reviews about the release of Indiana Jones themed M&M’s. I for one am not really fond of mint. – blech – yet, there was something intriguing about these candies. One day while I was shopping (last month), I spotted them and on an impulse purchased them. Anyway, when they were finally opened, I was greeted with some odd shaped candies but they still had the signature M on them. Then I noticed on a few pictures posted online that some had various designs that pertained to the movie. Bummer… mine were just plain. The kiddos opted not to try them first (no surprise there) so I was the lucky one to give them a whirl. I popped about two in my mouth. I was greeted with the minty sweetness of the chocolate then the crunchy rice center. The mint was not overpowering but quite nice; the rice center adds a nice texture to the candy. Spencer did try one and it was not his thing, Nate said that they were fine but would rather the plain M&M’s. 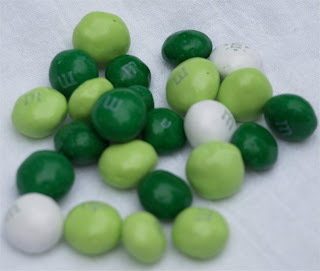 I however, Ms. No Like Mint, really enjoyed them. It was kinda like, eat one, eat another, how about a few at a time, trust me they are quite addictive. I hope they will be kept on the market after the movie is done. I think they would make a great after dinner candy or just because.